22nd October 2009:	After a number of revolts inside the detention centre Pagani on Lesvos island, the prison was finally officially closed and the last refugees left to Athens. Huge numbers of refugees had been imprisoned in the overcrowded prison all over the summer, leading to repeated uprisings. The refugees demanded freedom through hunger strikes, broke the doors of the cells and put the cells on fire. The revolts gained a lot of public attention and media coverage through the noborder action Lesvos 2009. 3rd February:	Refugees detained in Venna put fire on their clothes and mattresses to protest against their prolonged imprisonment and the inhuman detention conditions. Only three days later 42 of them were judged penalties of 4-6 months detention and following deportation without having any access to lawyers and interpreters. Then they were transferred to other prisons in order to isolate them. 13th March:	In the night of 13th March 2010, 35 detainees set the detention centre of the police station of Patras on fire to protest against their detention and the detention conditions. 14th of April: 8 migrants from Pakistan start hunger strike inside the prison of the Aigaleo police station in Athens to protest against maltreatment during detention. The police officers do not allow them to use the toilette or wash themselves. 13th–17th April:	124 detained refugees started a hunger strike in the detention centre of Samos protesting against the transfer of 60 refugees from Samos detention centre to a prison close to the Bulgarian border and to protest against their deportation. 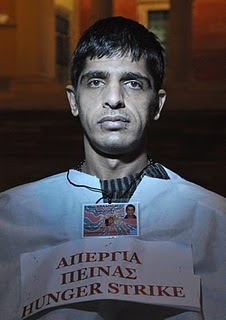 20th July:	Beginning of the hunger strike of Iranian refugees in front of the UNHCR offices Athens. At the 31st August the eight refugees were granted political asylum on their 38th day of hunger strike (some were on their 15th day). 22nd September:	100 Palestinian refugees started a protest and hunger strike in front of the Greek section of the UNHCR in Athens. They demanded asylum and housing from the Greek government (the protest is going on). 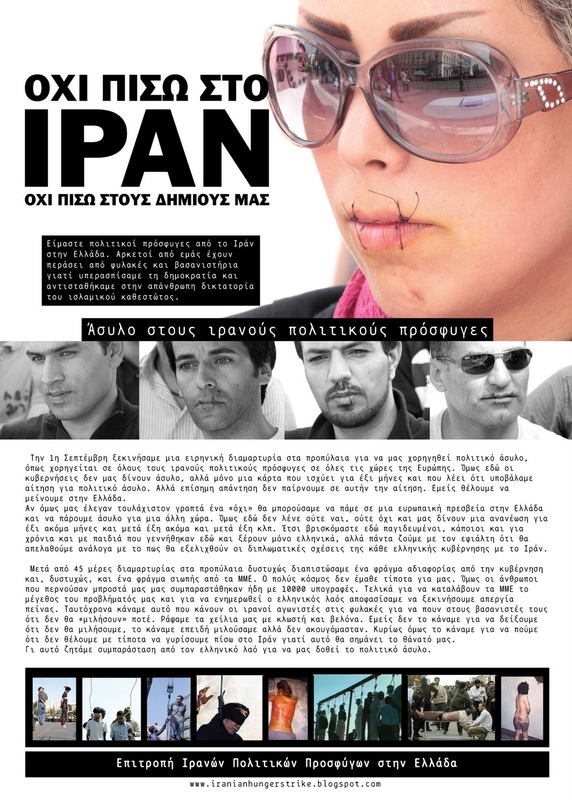 6th October:	Two Iranian refugees who were detained in Evros, around 25 to 30 years old, stitched their mouths using fibbers from their shoe-laces as an act of protest against deportation and for the right to political asylum. They were transferred to Alexandroupolis hospital at the 7th of November because of their worsening health condition but they denied medical treatment. Their protest reached the public through the statements of the director of the hospital who was anxious about their health condition. 28th October: Complaint by the International Federation of Iranian Refugees lodged with the European Court of Human Rights against the Greek government for its violation of refugees’ rights. 26th-29th October:	Hunger strike of 25 Kurds and 13 Afghan refugees in Lavrio reception centre demanding for asylum. Most of the refugees living in the oldest reception centre of Greece have been waiting since years for their asylum claims to be proceeded. The protest included the demands of the total of the reception centres’ population for better reception conditions. 9th November:	An Iranian refugee threatened to commit suicide inside the Greek council of Refugees in Athens demanding to talk to journalists. 22nd November: 14 migrants started a hunger strike in the prison of the police station of Chania, Crete and demand for freedom. 22nd November:	Four Iranian refugees sewed their lips and started a hunger strike in the detention facility of Feres, Evros. 23rd November:	The four strikers from Feres are transferred to Soufli in a special “disciplinary cell”. They continue they hunger strike. 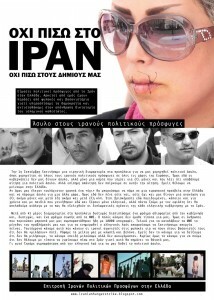 25th November:	Four sans papiers immigrant prisoners from Palestine sewed their lips together with needle and thread at the Kassaveteia Prisons near Volos, central Greece, protesting their prolonged and completely unjustified imprisonment, while another three refused their meals. In the last fourteen months, all seven of them, together with another 25 Somalis, Afghanis and Palestinians, have been pushed from one prison to another, after they were arrested for the sole crime of illegally entering the country. Their release is pending while the deportation is also being legally processed. 9th April: 29 women start a hunger strike in Ferres detention centre to protest against the long detention period (most of them are already more than 3 months in prison), against the wrong registration during the screening (most of the black Africans have been registered wrongly as Nigerians and are thus in danger to be deported) and against the detention conditions. 28th April: 12 refugees start a hunger strike inside the detention centre of the border guard station Soufli in Evros to protest against the detention conditions and demanding freedom. Among them a 6 asylum seekers; some detained for more than 5 months. The strikers are from Iran, Iraq, Turkey, Nigeria and Syria. There were/are many more protests. It is impossible to tell about all of them.